1642 – 30 Catholics are killed by the Scottish garrison and English settlers at Island Magee, Co. Antrim. 1794 – Birth of Mother Frances Mary Teresa Ball, the foundress of the Irish Branch of the Institute of the Blessed Virgin Mary (IBVM). 1829 – Birth of Thomas William Robertson, known professionally as T. W. Robertson, was an Anglo-Irish dramatist and innovative stage director best known for a series of realistic or naturalistic plays produced in London in the 1860s that broke new ground and inspired playwrights such as W.S. Gilbert and George Bernard Shaw. 1873 – John J. Flanagan, hammer-thrower and shot-putter, is born in Kilbreedy, Co. Limerick. 1900 – Birth of Harry Kernoff in London, artist; resident of Dublin from the time he was 14 years old. 1904 – George Buchanan, poet, novelist and journalist, is born in Kilwaughter, Co. Down. 1909 – Ernest Shackleton, leading the Nimrod Expedition to the South Pole, plants the British flag 97 miles (156 km) from the South Pole, the furthest anyone had ever reached at that time. 1909 – Birth of Rev. Fr. Patrick Peyton, CSC, an Irish-born Roman Catholic priest, devout promoter of the works & inspirations of the Blessed Virgin Mary and is the founder of the post World War II prayer movement called, “Family Rosary Crusade.” This campaign was harnessed by the CIA between 1958 and 1965 and funded in order to combat leftist influence in Latin America. 1922 – Eamon De Valera resigns. 1922 – Arthur Griffith is elected Taoiseach of Dáil Éireann after Eamon de Valera steps down. 1923 – Anti-Treaty IRA men burn the home of Free State Senator John Philip Bagwell at Marfield, Clonmel, County Tipperary, including the extensive library built up by his father, historian Richard Bagwell. 1929 – Brian Friel, playwright and author of Dancing at Lughnasa, is born near Omagh, Co. Tyrone. 1951 – The Northern and Southern governments agree on the running of the Great Northern Railway. 1952 – Birth of Danny Morrison, former publicity officer for Sinn Féin, and now a novelist. 1962 – Birth of Ray Houghton, footballer. 1998 – Mo Mowlam, risks her political future in talks with loyalist paramilitaries inside the Maze prison in a desperate bid to save the troubled Northern Ireland peace process. 2000 – Boy band Westlife retains their place at the top of the charts to become the first act in more than a year to hang on at number one for longer than three weeks. 2001 – For the first time ever, electric power comes to the tiny islands of Inishgort and Inishlyre in Clew Bay. 2002 – Former soviet leader, Mikhail Gorbachev, accepts the honour of being named the 71st Freeman of Dublin, following in the footsteps of Pope John Paul II, Nelson Mandela and members of U2. 2002 – Police are attacked with bricks and bombs by rioters from both sides of the sectarian divide, as bigotry and violence flare again at the Holy Cross Primary School in Ardoyne, north Belfast. 2012 – Singer Bridie Gallagher passes away at age 87. Known professionally as the ‘Girl from Donegal’, over a 50-year career she played everywhere from the Royal Albert Hall in London to Carnegie Hall in New York and Sydney Opera House. Born in Creeslough, Co. Donegal, Bridie Gallagher made her home in Belfast almost 60 years ago and it was there she was discovered by a Decca talent scout in 1956. Her first single for them – A Mother’s Love’s a Blessing – was an instant hit and within a few short years she was performing on Sunday Night at the London Palladium. The late 50s and 60s saw tens of thousands of Irish people emigrating. In Britain, America and Australia, Bridie had ready-made audiences who packed out the venues she played. In one particularly memorable show at the Albert Hall mounted police had to be used to hold back fans who blocked the surrounding streets. 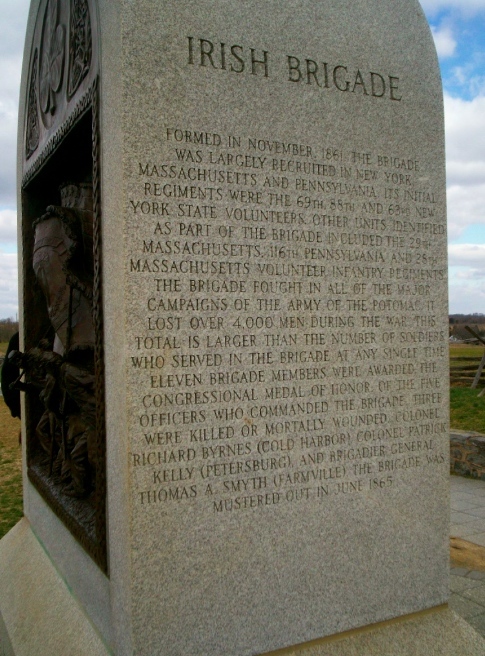 Photo: Irish Brigade Monument, Antietam National Battlefield.